Dear Friends, Wish you All a Very Happy New Year - 2015. May this New Year brings you all happiness. To celebrate the New Year, I have a simple yet healthy sweet. Moong Dhal Ladoo is a delicious traditional sweet. This is easy and quick to prepare. 1) Heat a kadai. Medium the flame. Dry roast moong dal until it turns golden brown in color. Let it cool. 2. Grind to a fine powder. Sieve and keep aside. 3. Powder the sugar. Sieve and keep aside. 4. Melt ghee. When warm, combine ground moong dhal, sugar, roasted nuts and ghee in a bowl. 5. Make medium sized ladoos. With the above given measurement, you can make up to 10 ladoos. Delicious laddoos. Just loved the presentation and the perfect shape. 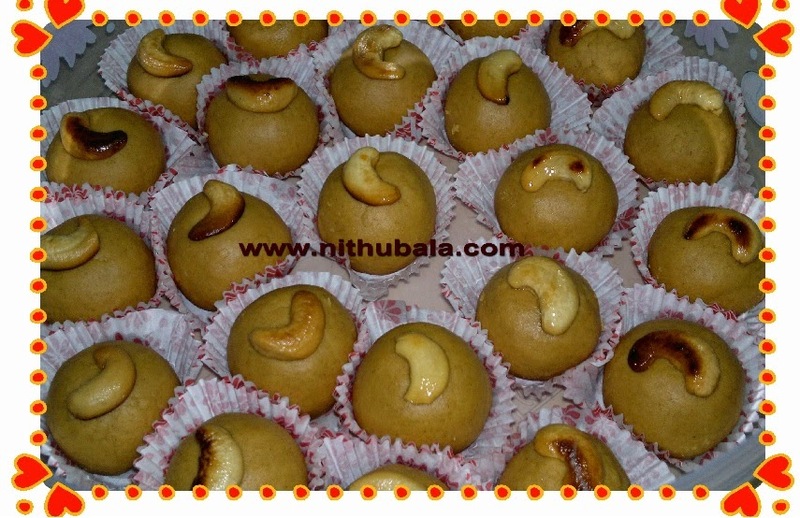 Will surely prepare the laddoos as per your process and will share the feedback with u. Thank u for the wonderful share.